“It’s just impossible to keep track of everything,” my friend Sophie told me over coffee a few weeks ago. She’d just started a new job as the administrator of a growing nonprofit organization, and although she had been working hard to stay on top of the financial and administrative work, she was feeling completely snowed under. Her organization just didn’t have the right tools to get it all done, she told me. Her nonprofit’s current finance system was so confusing that Sophie was terrified of making errors, and it took hours to do even routine tasks. It involved tracking payments in Excel, then creating multiple reports from scratch, and constant switching between different systems to manage donations, invoices, and payroll. The process meant that some entries were duplicated, others were missed entirely, and often she’d have to start over from scratch. Sophie and I sat down and Googled all the accounting softwares tailored to nonprofits. Within the afternoon, we discovered an easy and inexpensive option that suited her needs perfectly. When we met up again the next week, she was beaming. The software had cut the hours she spent tracking finances into minutes — and the best part was that she was able to set up everything herself. If you’re looking for a nonprofit accounting software solution, look no further. I’ve rounded up all the most popular options into this list. I’ve also highlighted the major benefits of each one and given advice on the kind of nonprofit they might suit best. Nonprofit accounting software helps organizations manage financial administrative work, such as incoming and outgoing payments, budgeting and reports. Unlike general accounting software that focuses on the amount of profit made, these programs are designed to handle project-focused accounting. Many also include tools for accepting donations, planning and reporting for specific grants, and presenting figures in a transparent way to donors and board members. These platforms allow organizations to manage many elements of their finances in one place, and even automate some recurring tasks, reducing the chance of errors and duplication, and saving valuable hours each week. If you’re a small or mid-sized nonprofit and don’t need complicated financial tracking, you may benefit from using an all-in-one membership management software solution. This can simplify your inbound cash flow by accepting donations, event ticket payments, store purchases and subscriptions all from a central membership platform, saving you time when it comes to keeping on top of your accounts. Wild Apricot’s membership management software accepts online payments, generates invoices, and records amounts received, in addition to providing a range of other tools including a website builder, email marketing and event registration. Wild Apricot even has an inbuilt online payment processor, Wild Apricot Payments (powered by AffiniPay), as well as integrating with other services including PayPal and Authorize.net. You can learn more about membership management options in this blog post. 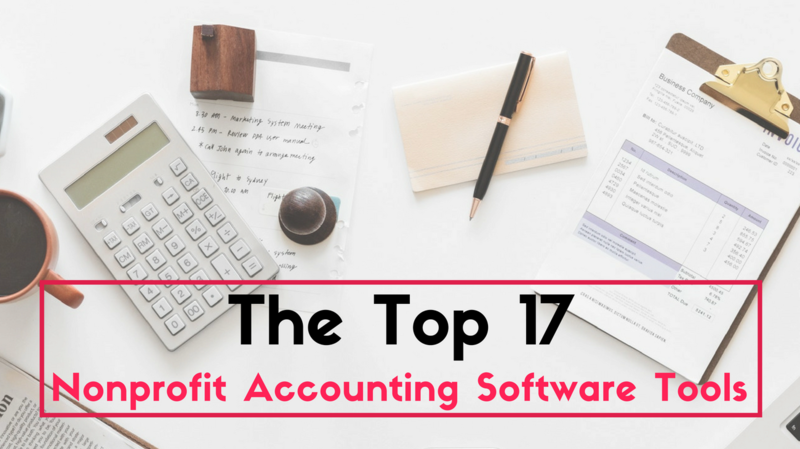 This guide brings together the top accounting software solutions that many nonprofits use, listed in alphabetical order. There are options for organizations of all sizes and budgets, and each has a unique set of features, so take a few minutes to read through and see which might suit your nonprofit best. Is the system easy to learn? Is there support available? How quickly do you need the software to be set up? Do you need integration with other systems? If you’re unfamiliar with accounting terms and lingo, I’ve also included a glossary of some of the finance and software terms that come up frequently in this list. To view it, just scroll down to the bottom of this page or follow this link. With this information at your fingertips, you’ll be ready to choose a software solution that will help you set up quicker, more accurate finance procedures, and free you up to focus on your nonprofit’s mission. Abila software is scalable, customizable, and has offerings for both small and large organizations. It offers both on-premise and cloud-based options, and even has a mobile app to enable access on the go. Standard features include a general ledger, accounts payable, and budgeting functions, and optional extras include payroll, human resources, and multi-currency functionality. With 25 modules you can choose from, Abila lets you build a solution that suits your nonprofit. AccountEdge Pro is a desktop accounting solution for small businesses, with an optional cloud app for more flexible access. It allows you to manage banking, credit card and expense accounts, and set up recurring transactions that include a reminder to record them. It has a comprehensive payroll system with a setup assistant that walks you through getting started, and an option to add on a payroll tax module for an additional fee. AccountEdge will also send a free copy of the software to your accountant to make sure you’re on the same page. AccuFund is geared specifically towards nonprofits and government agencies, and has industry experts available to help support the service. The software is available as either an on-premise or cloud-based solution, and there are a range of add-on modules including payroll and grants management, making this a fairly flexible solution. Core features include accounts payable, budgeting, bank reconciliation, cash receipts, and a financial report writer. Adaptive Insights is an analytics and financial planning software that can help your nonprofit with budgeting, planning and forecasting. Self-service reporting allows you to include dimensions such as project, location, or fund, and the interactive dashboards make it easy to track KPIs. Accurately plan revenues and expenses, model different scenarios and incorporate contingency planning to help allocate resources and budget for your nonprofit’s future. Aplos is an online solution for small to medium-sized nonprofits and churches that prides itself on being straightforward to use. All plans include customizable donations pages, fund accounting, reporting and budgeting, but the Standard plan also includes donations and special gift tracking, and the Advanced plan tops this up with fundraising and Form 990 reporting too. Argenta by Devscape focuses on integrating and automating daily tasks, saving you time to spend on the things that really matter. There are even built-in checklists and project management tools to help you keep on top of everything, and real-time campaign analytics that let you track your successes as you go. Donations, expenses and invoices can be added to the fund accounting system with the touch of a button, and the cloud-based system ensures your data is accessible whenever and wherever you need it. Blackbaud has a large range of nonprofit solutions, including their accounting software, Financial Edge NXT. Their Nonprofit General Ledger structure enables reporting by project, grant, department, or any characteristic that suits your organization, and you can also create multiple “what if” budget scenarios to measure the impact of potential change. Financial Edge NXT is suited to larger nonprofits with complex accounting needs — it’s designed to work with other Blackbaud products such as Raiser’s Edge, and offers control tools to ensure compliance and prevent fraud. Breeze is a web-based church management software option. With Breeze, you can store and search data on members, communicate with groups, schedule events and track donations. The data from donations and contributions can then be imported directly to your Quickbooks account, with all the usual features on this platform. Breeze make the software really straightforward to join: they have one price, with full access and support included, and they will even import all your data for you at no extra cost. Denali Fund is made for small to medium sized nonprofits with multiple funds, and can either be an on-premises or a cloud-based accounting solution. Denali’s fund accounting software emphasizes security — their uncompromising internal controls allow nonprofits to maintain oversight of staff and define role-based access for each user. Denali allows for both unlimited and restricted funds, and gives you the ability to create custom reports. FUND E-Z is a fund accounting software solution that has been established for 20 years, and enables you to create and track budgets for multiple projects and funding sources. Fund E-Z is ideal for large nonprofits and nonprofits with complex accounting needs. The interface makes large volumes of data easy to sort, filter and export, and you can grant user rights by function, hiding sensitive data as required. Automatic backups, crash protection, and audit features that track modifications of data keep your data secure and keep you in control. Nonprofit Plus uses the Acumatica finance suite to offer a range of functions. As well as fund accounting, through Nonprofit Plus you can also manage your board, volunteers, donors, grants and budgets. Nonprofit Plus works with a range of industries, and offers additional services including software development, project management and consulting. This is a comprehensive solution, designed for enterprise-level nonprofits. QuickBooks is one of the best-known accounting software solutions, and the Desktop Premier package adds industry-specific features, allowing existing QuickBooks Premier nonprofit users to also manage grants, donors, and programs. You can create custom reports for each fund or project, accept donations and stay IRS-compliant. QuickBooks integrates with many other programs, so you can build a customized solution that suits your organization. Keep in mind, because it is a locally installed software, it does not allow for the flexibility of accessing it anywhere that a cloud-based system offers. Sage Intacct has an open API structure, meaning that it allows the accounting system to integrate with other business applications like your CRM or payroll, including Salesforce. As well as a general ledger and accounts payable, Sage also has purchasing, cash management, and reporting and dashboard as core features, and you can add additional modules such as contract billing and project accounting to customize the platform. SparkRock is made for large nonprofits with a generous budget seeking fund and grants accounting, alongside accounts payable, accounts receivable, and budgeting. Additionally, it has products that provide workforce management and K-12 school board management, so it’s particularly well placed to work for schools. Because it’s built on the Microsoft platform, it works seamlessly with Skype and Office 365 applications. Sparkrock really stands out with their support: as well as unlimited access to the support desk, they host a user conference, have a selection of training videos and a team of expert consultants. Traverse NFP focuses on requirements specific to nonprofits, including being able to handle international project and currencies, donor rosters and varying reporting periods, and aims to free up your time to concentrate on your mission. You can export reports to MS Office applications with just a few clicks, making them easily shareable with board members. Traverse gives access to general ledger, accounts payable, and payroll applications, and has the fund accounting features frequently requested by nonprofit organizations. Cost: QuickBooks starts from $20/month. Wild Apricot starts from $40/month. Demo: Register for a trial and you’ll receive links to videos and webinars that show Wild Apricot in action. Wild Apricot is a complete membership management software solution for small and medium sized nonprofits. Over 3,800 nonprofits save up to 20 hours each week by automating admin tasks such as email communications, membership renewals, event registrations and online payments. Wild Apricot integrates with QuickBooks, a robust accounting software that handles invoices, receipts, bank reconciliation, bill payments and expense tracking, so you can seamlessly manage your nonprofit’s finances. Zoho Books is online accounting software for small businesses, with features that manage expenses, track inventory, create invoices and generate reports. It’s cloud-based, and you can access the dashboard from your iOS, Android or Windows device. Zoho isn’t specifically for nonprofits, but it does offers two nonprofit modules: Donor Management and Volunteer Portal. These free add-ons allow you to keep a database of donors, and send notifications to volunteers when you create events near them. Hopefully this list has helped you start building your accounting software shortlist — there’s something here to suit every nonprofit. Good luck with your search! This is just a quick guide to terms used in this list — you can find a more complete glossary on the NYSSCPA or Accounting Coach websites. Accounts payable — The money your nonprofit owes other companies. Account receivable — The money your nonprofit is owed by other companies. Bank reconciliation — A statement that identifies the differences between the balance shown on your bank statement, and the balance shown in your records. Cloud—based software — Software or services available via the Internet. CRM (Customer Relationship Management software) — Technology used to manage interactions with customers. Dashboards — A financial reporting tool that shows summaries of key data trends. Form 990 — A form that the Internal Revenue Service of the United States requires many tax-exempt organizations to complete. Fund accounting — A system of accounting that tracks finances according to a particular project or purpose. General ledger — The master set of accounting records for your nonprofit. Grants management — The tasks required to handle the financial, reporting, and program requirements of a grant according to the satisfaction of the body funding the grant. Inbound cash flow — Money that your nonprofit receives through transactions. KPIs (Key Performance Indicator) — Measurable factors used to track success. Locally installed software — Software that can only be used on specific computers that have had the program installed. On-premises software — Same as above. Restricted funds — Money that can only be used in a specified way. Why Create an Annual Report?